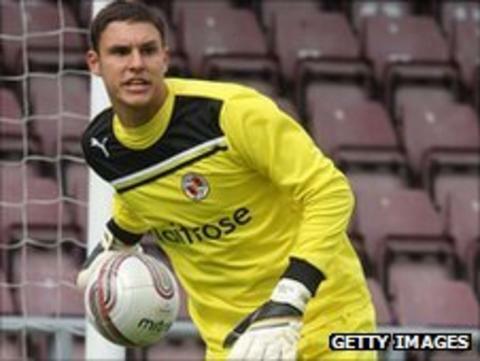 Leeds have signed England Under-21 keeper Alex McCarthy on a month's loan from Championship rivals Reading. With first-choice Andy Lonergan injured, Leeds boss Simon Grayson decided he needed extra cover after the 5-0 midweek loss to Blackpool. "They are keen for him to play games and hopefully his loan spell here will help with his development," Grayson told Reading's website. McCarthy goes straight into the squad for Sunday's game at Leicester. And he could be handed a place in the starting line-up after three mistakes by Paul Rachubka against Blackpool, which all resulted in goals, saw him replaced in the second half by youth-team keeper Alex Cairns. Leeds fans may remember McCarthy following his man-of-the-match performance for Reading at Elland Road in last season's 0-0 draw. And Reading boss Brian McDermott admitted he was in two minds about letting him move, albeit temporarily. "We had a phone call from Leeds and Alex was excited about the possibility of going there," McDermott told BBC Radio Berkshire. "I spoke to Simon Grayson and I think in this case I have to do right by Alex McCarthy. He has done really well for me and I have three keepers at the club who are capable of playing in the Championship. "I need to give Alex more games and more experience of this level so that was the thinking behind it. "It was a tough call but I think in the long term for Reading and for Alex it's the right call."